A frame from Abe Zapruder’s historic home movie of President Kennedy’s assassination. It is a home movie that many Americans have seen but few know much about. In the late morning of Nov. 22, 1963, Abe Zapruder, owner of a Dallas clothing manufacturer, left work and made his way to nearby Dealey Plaza to film President Kennedy’s motorcade. Although Abe had forgotten his 8mm camera at home that morning, colleagues persuaded him to retrieve it. He loved filming. The first image on the reel he used that day features two of his grandchildren playing, soon followed by test shots of the plaza. Just before the motorcade turned onto Elm Street, Zapruder, perched atop a four-foot high concrete abutment, turned his camera on, began tracking the president’s car, and ensnared himself and his family in a pivotal moment in American history. Alexandra’s book is indeed a “personal” history. And to be sure, it also explores the impact of the film on American culture. 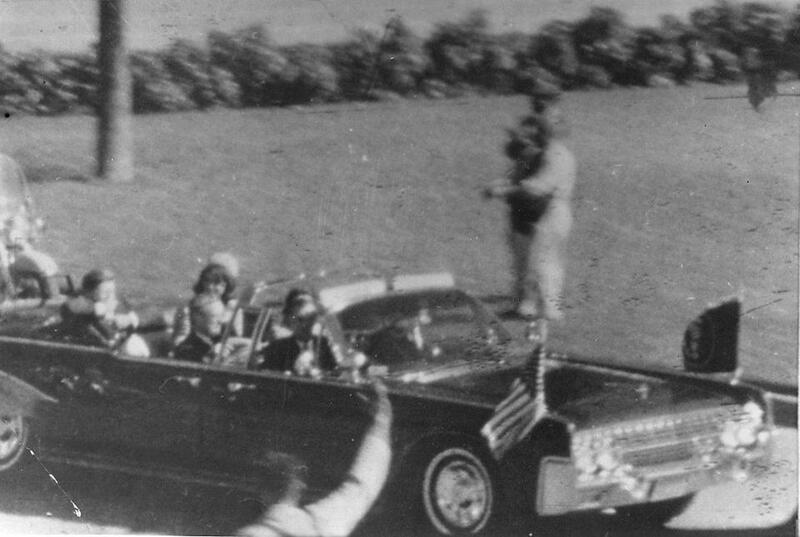 But the bulk of “26 Seconds” chronicles the comings and goings of the footage and argues for the decency of the often-maligned Zapruder family, who have largely remained silent about their role in history, one that prevented them from being able to fully inhabit the normal, poignant human obscurity that most of us enjoy. Making use of family and government archives, interviews, and her own memory, Alexandra offers a supple, tender portrait of a family lashed to history. She does an admirable job normalizing her family. In the 1940s, her Ukrainian-born grandfather had decamped from New York, his family’s first home in America, to Texas to elevate his garment business. Alexandra’s father, Henry, who would later become the film’s executor, had just started working as an attorney in the Kennedy Justice Department mere weeks before the event. Soon after the shooting, a few reporters learned of Abe’s film and offered to buy it. But the shaken businessman, after talking to son Henry, refused to turn it over to anyone but the Secret Service, who allowed the family to keep both the camera and the original. The film later became a key piece of evidence for the Warren Commission, which investigated the killing (and the film, frame by frame), as well as all subsequent examinations. Through the years, the Zapruders have been tarred by some as venal opportunists. Readers with any sense of sympathy will feel compelled by the book’s defense of the family. The family did receive financial benefits from the film — days after the tragedy Abe sold the film to Life for $150,000, believing that the trusted news magazine would be unlikely to sensationalize it. The publisher would, however, sell back the footage and rights to the family for $1 after it tired of the responsibility of policing the use of the controversial, historic footage. While retaining a sense of ownership was important to family members, they went to lengths to accommodate most all government and public requests for usage. In 1999, the US government paid Zapruder heirs $16 million for the original film, and the family donated the rights to a museum. “26 Seconds” convincingly argues that, more than greed, a common-sense view of providing for the family structured these decisions. Tracing the uses and transfers of the film takes up a lot of space in the book. Throughout Alexandra interrogates the vexing questions raised: Does society deserve to see or be shielded from this horror? Who should be the firm’s rightful owner? Is it acceptable for a family to profit from such an artifact? And then there’s a question that hovers over the entire book: Why didn’t the Secret Service just take possession of the film once they learned of it? That’s a question of our time, of course. In 1963 home movies were novel, and most people didn’t anticipate their historical value. It’s undeniably true that the Zapruder film ranks alongside images of 9/11 and the Challenger explosion as icons of national trauma. Alexandra makes these connections but misses the fact the film also serves as an origin story for civilian-created records of violence, which have mushroomed recently in the police killings of young black men. A missed opportunity, but one that, admittedly, falls outside Alexandra Zapruder’s ambitions. “I am drawn to the study of history,” she writes early in the book, “and I am especially curious about how simple narratives conceal much deeper, more complicated and interesting truths.” A goal “26 Seconds’’ undeniably accomplishes.